Saturday, April 28 from 10:00 a.m. until 6:00 p.m.
JAPAN FES. 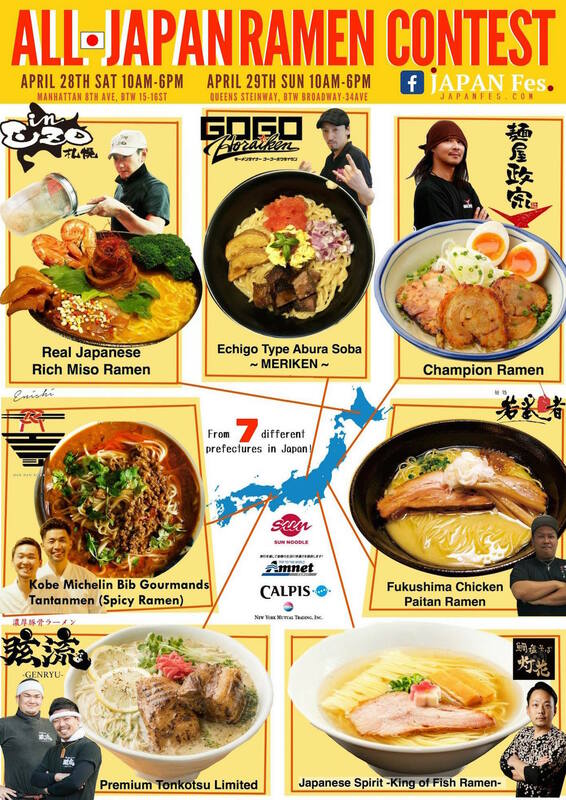 will host two ramen contests this weekend, and for the first time all of the competitors are from Japan! 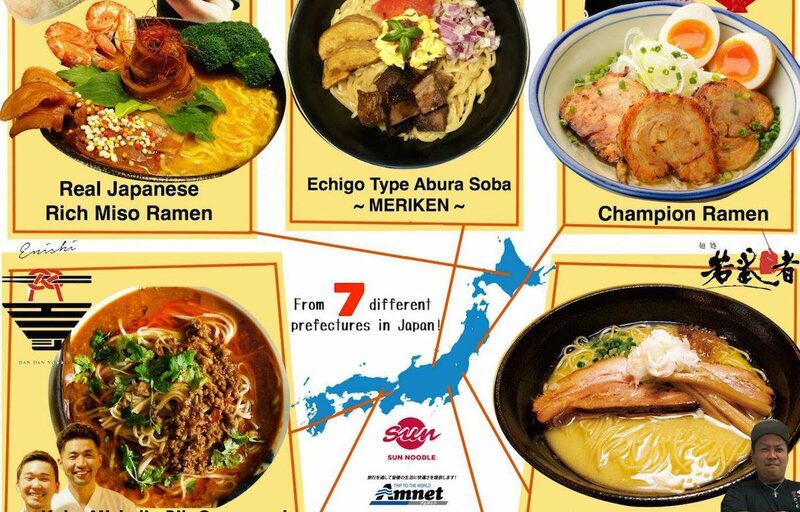 Seven ramen shops representing different prefectures and showcasing distinct styles from East and West will compete for the title of Ramen Shop Champion of NYC. Each bowl of ramen is $10 (cash only). The public will vote, and the popular vote will win! Sunday, April 29 from 10:00 a.m. until 6:00 p.m. 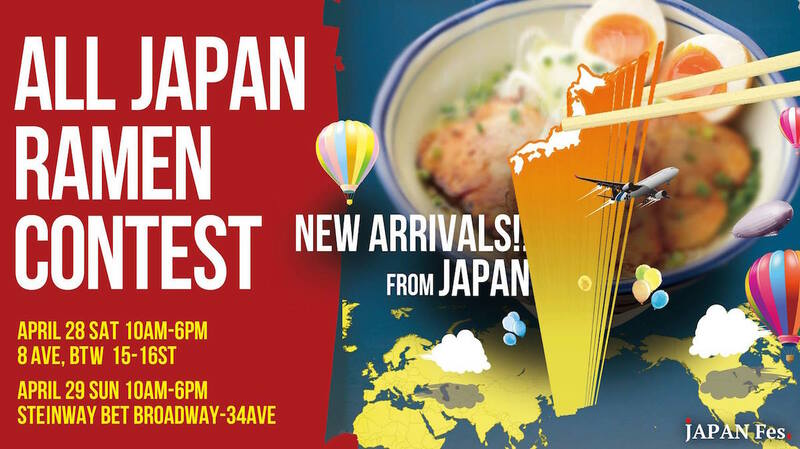 The All-Japan Ramen Contest moves to Queens on Sunday, April 29. The same ramen shops will participate, and there will be performances by TiA, a Japanese recording artist who sings the end theme of NARUTO; Mana Ito, an actress and singer who is a former member of Japanese idol girl group SDN48; and dancer Haruka Honoki, a Top 10 finisher at Apollo Theater Amateur Night 2017. Japanese singer Kohei, the official emcee of JAPAN FES., will host. JAPAN Fes. is sponsored by Sun Noodle, Amnet USA, Calpis Lacto Mutual Trading Co., Inc.
For more information, please visit the JAPAN Fes. website and Facebook event page.